Unicorns and rainbows and magic and dessert. 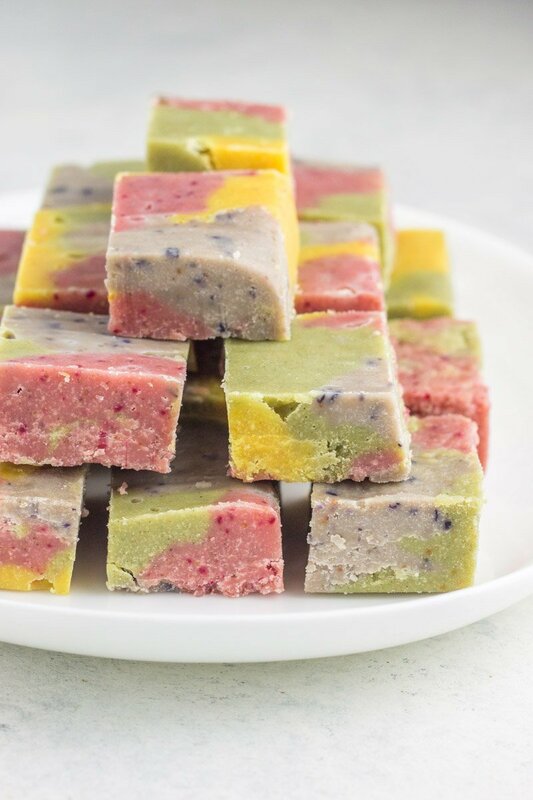 It’s all rolled into every sweet bite of this paleo unicorn fudge. A perfect no-bake treat that both adults and kids love. Made with simple ingredients and a few pops of natural color, you’ll never look at ‘fudge’ the same. 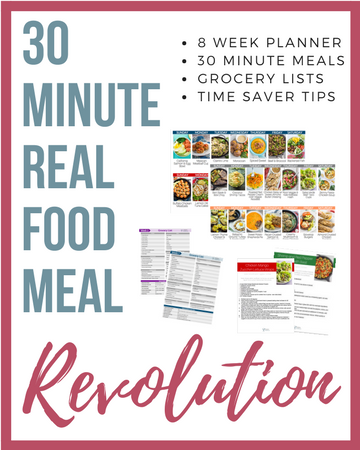 I’ve been drooling over this recipe since I first created it a few months ago. In a nutshell, nut butter and coconut butter are two of my favorite things in the whole, wide world. Then they made a baby and called it paleo unicorn fudge. I KNOOOOW fudge is a deceiving word, because this recipe don’t have chocolate (or cocoa or cacao or whatever). But the consistency is JUST like fudge – so alas, we’re calling it fudge. And because cashew coconut butter fudge is just too long and confusing. Plus who doesn’t love anything with the title of ‘unicorn’ in it? I rest my case. 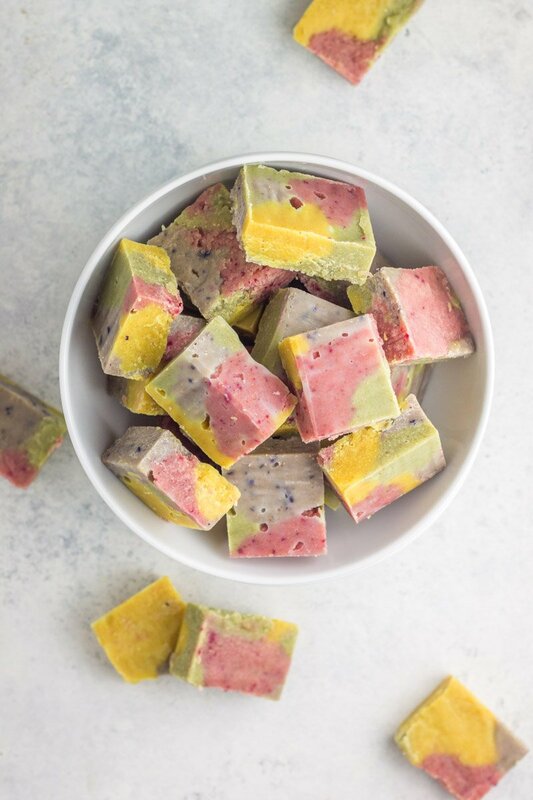 Took me a few attempts to get the color down with this paleo unicorn fudge, mainly because I was determined not to use any artificial food dyes. So I’ll keep it real with you guys, adding all the fun color is a PITA (Google that acronym if you have no clue). It’s awesome, but a little time consuming. 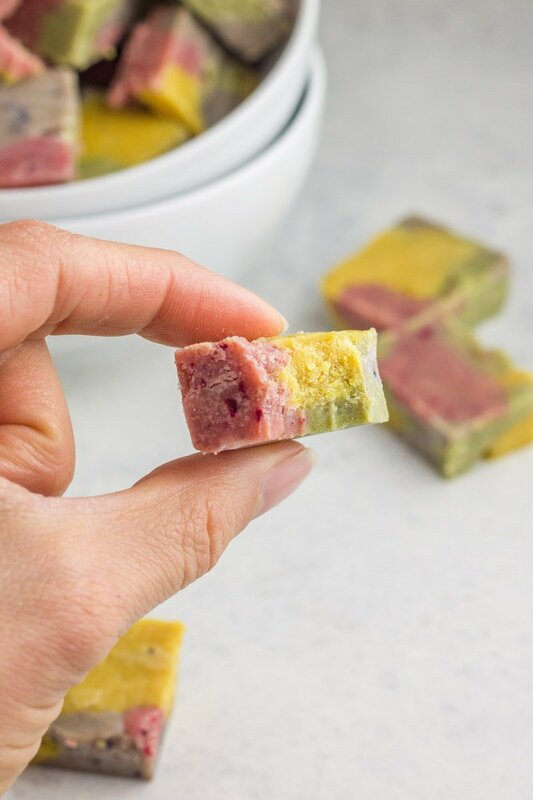 Luckily you don’t HAVE to add the colors – this paleo fudge tastes amazing with, or without the fun color variety. 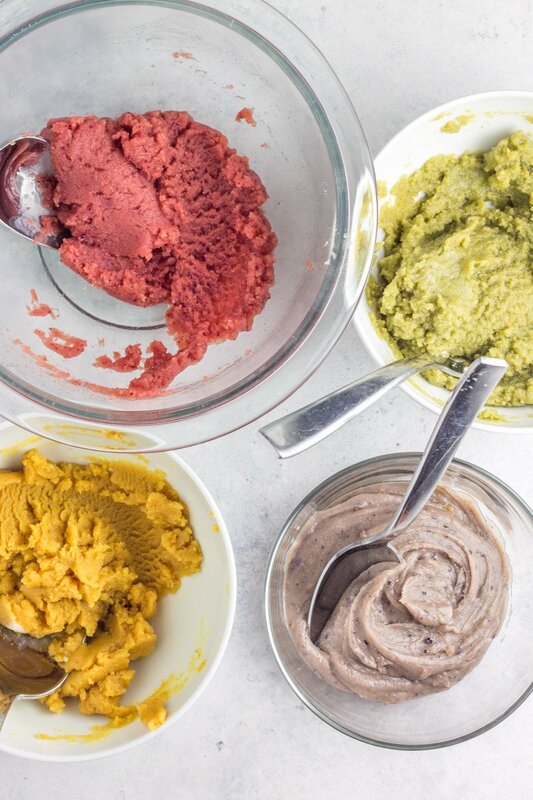 It’s not easy making blue, yellow, pink, and green without food coloring. Legit challenging. But I’ve managed to figure it out (sort of. I won’t admit these colors are spot on, but I tried). 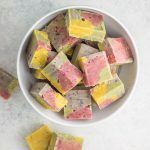 The cool thing is when I want to make this paleo unicorn fudge for valentines day, St. Patty’s day, or Easter, I’m good with nailing one ‘themed’ color and calling it a day. But back to the recipe – STUPID simple ingredients make this paleo fudge amazing. The consistency is perfection, the flavor is on point, the addiction is real. It might be one of my favorite paleo desserts ever. And I love a square or two after my morning coffee – all that healthy fat keeps me going all morning. Wondering what coconut butter is? It’s basically pureed, unsweetened coconut. You can make it yourself or get a jar HERE. 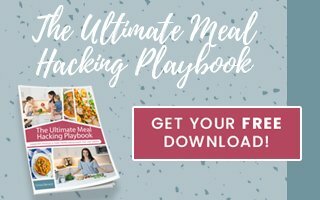 Speaking of healthy fat, this is a treat I gladly serve my little guys – their never-ending metabolisms need food to fuel their never-ending energy. And this paleo unicorn fudge does just that. Time to try something new this summer – a healthy dessert recipe perfect for any occasion, any time of day. And here are some other no-bake paleo treats to try while you’re at it! Paleo Key Lime Pie Energy Balls, No Bake Fruit Pizza, Black Cherry Chocolate Chunk Almond Butter, Paleo Lemon Strawberry Cheesecake. 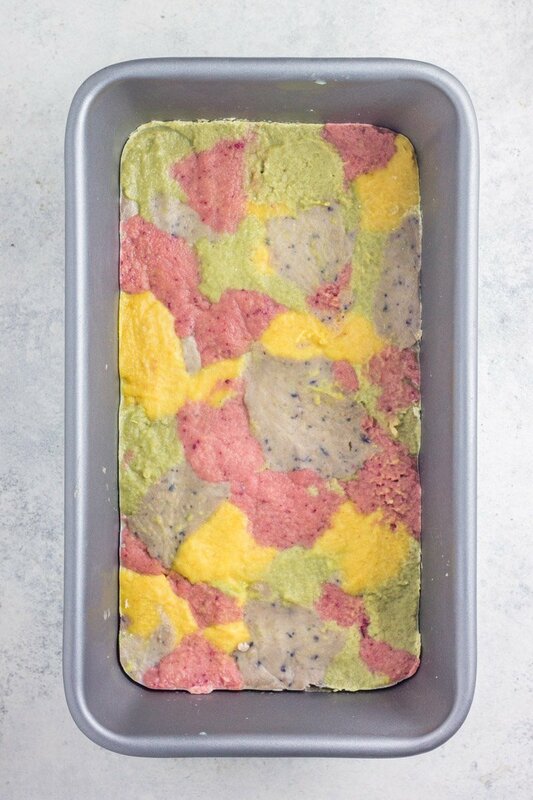 If omitting the extra step of adding colors, line a loaf pan with parchment paper and pour the mixture into the pan. Press the top with a spatula to flatten then skip to step 5. If adding the colors, proceed to the step below. I’m confused at the blueberries make pink and the beets make purple… Is that correct?